Our runners have now completed 66.1km of the 160 total. Tonight they will start at 6 PM and run 16 km of extreme hills. This is the segment that I aspire too complete. I need huge amounts more training, but when I finally complete the sense of satisfaction will be immense. I have been trying to upload some pics, but blogger is having trouble. Will update the post once I can add the appropriate photos. Theme for today is 'BBQ Dinner'. 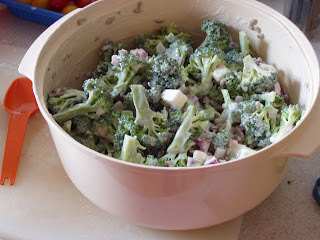 Today I have made another bowl of the famous 'Broccoli Salad'. 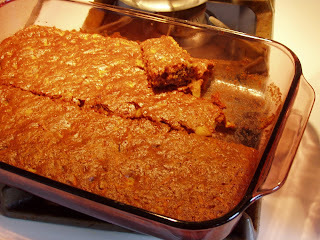 I have also made a pan of 'Carrot Cake Bars'. I substituted orange juice for the 1/4 cup of milk. Now it is lactose as well as soy free. Does not seem to affe ct the taste one bit. Both recipes are from 'Lighthearted Everyday Cooking' by Anne Lindsay. I have to run now and get over to those hills. I will undoubtedly be posted at a water station handing out numerous cups of water and Gatorade. The temperature is still around 26C and the humidity is a bit lower today at 65% meaning it still feels like 33C. the carrot cake was good! I enjoyed it. & hanks for being there and handing out water and gatorade! Glad that you enjoyed it April. I am liking the challenge of finding appropriate recipes that also taste good. The cake sounds yummy!! I have an award for you. You can pick it up over at my place, A View of My Life. Have a great day! I've been loving the food this year Heather. The team has been doing an amazing job as usual.